Only about 8.5% of the S&P 500 companies have reported third-quarter earnings so far. Of them, 74% beat their estimates, both on their top and bottom lines. 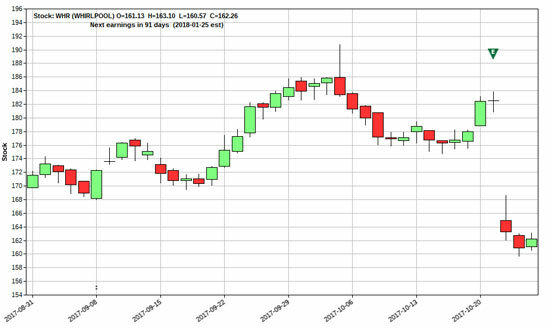 But in my 30 years of trading, I’ve seen plenty of instances like this where even after a good earnings report, the stock gets hammered by 10%, 15% – even 20% – in a single day. And it happens because of bad guidance given by the Wall Street analysts. But the truth is, they don’t know any more than your local mail carrier does. The good news is… you don’t actually need to know. Third-quarter (Q3) earnings season unofficially kicked off last Wednesday, with Alcoa Corporation (AA) reporting an earnings miss of $0.72 on a $3 billion revenue. Expectations were for $0.75 per share on a revenue of $3 billion, and revenue fell 43% from Q3 last year – despite it meeting expectations this year. That caused a a slight drop in the stock (from $37 per share to $36 per share), but it climbed back up to $38 per share (as of the time of writing). 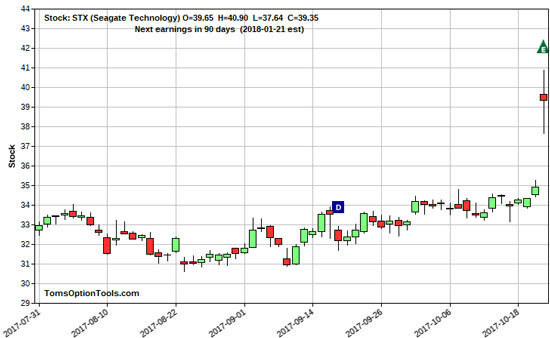 Now you might think that an earnings miss would’ve affected this stock much more, but there were no real dramatice price move. Some stocks experience huge moves – for better or for worse – depending on the earnings report, analysts “guidance” about what to expect ahead of earnings, or a combination of both. STX crushed eps projections by $0.10, and the stock skyrocketed 12% or more on the pre-market open and pretty much stayed there for the rest of the day. If you were bullish and held STX over earnings, then you had a good day. If you were short, or were only holding long puts through earnings, you might be left wondering what you were thinking. Now when companies release earnings information, it can trigger huge price explosions… up to 2,150% bigger than normal market moves. And my colleague Chris is one of the few experts who can show you how to predict and profit from these price explosions. Click here to learn more. But there’s plenty of cases where stocks don’t fare well due to earnings, like Whirlpool Corporation (WHR), which reported an eps of $3.83 on a revenue of $5.4 billion. Consensus estimates were for an eps of $3.90 on a $5.5 billion revenue. Just off of a bad earnings announcement, the stock fell nearly 7% from its closing price of $182.50 to $170.50. So if you were bullish on WHR through earnings, you may be saying “ouch” right now (or another four-letter word). And if you were holding long puts, you probably captured some nice profits. The bottom line here is… trading options through an earning report is a crapshoot. A company could get great press before an announcement but report worse than expected earnings, causing the stock to tank. Or, a company could get horrible press going into earnings but meet or beat expectations, causing the stock stock to skyrocket. In both instances, poor guidance or off-the-mark predictions put you in position to take a huge loss – or miss out on huge profits. In terms of trades through earnings, I’d consider options with expirations that are at least 30 to 60 days out. When it comes to exiting, I typically recommend in my premium service that members get out of their trades right before earnings announcements. That way, you’re in position to merely shave a few bucks off your profits than facing a larger than expected – and wanted – loss. We’re in the midst of the greatest investing boom in almost 60 years. And rest assured – this boom is not about to end anytime soon. You see, the “flattening of the world” continues to spawn new markets worth trillions of dollars; new customers that measure in the billions; an insatiable global demand for basic resources that’s growing exponentially ; and a technological revolution even in the most distant markets on the planet. And Money Morning is here to help investors profit handsomely on this seismic shift in the global economy. In fact, we believe this is where the only real fortunes will be made in the months and years to come. The bottom line is this: With U.S. influence slipping, and the dollar declining as well, investors who think too narrowly about this transformation will face years of meager returns. But those who embrace this new global reality can make themselves very wealthy. Consider what the World Bank and the prestigious McKinsey Global Institute recently concluded in their yearly reports on global finance; # From 2005 to 2010 alone, worldwide wealth will soar from $118 trillion to more than $200 trillion – with the newly capitalist markets of Asia and Europe accounting for the biggest share of that gain. # Over the next 25 years, America’s share of the worldwide economic pie will slip from 28% to 24%… # Even as Asia’s share almost doubles ;which means it will account for a whopping 55% of the global economy by 2030. Unfortunately, without guidance, few investors will be able to capitalize on this once-in-a-generation opportunity with knowledge and safety. You see, one sad fact remains true on Wall Street: If you’re not a partner in, or client of, a major investment bank – or if you don’t have a securities portfolio worth $5 million or more – you are most likely out of luck. The big brokerage firms are making a killing on the global boom. Yet Wall Street reserves the timeliest information – and the best profit opportunities – for its partners or wealthiest clients. And the Securities and Exchange Commission doesn’t help the everyday investor much either. The second sad fact is this: While you can buy any U.S. or Canadian stock you want, the SEC prohibits you from purchasing many of the available international stocks. The reason: Foreign companies that haven’t registered with the SEC are off-limits to most U.S. individual investors. And with Sarbanes-Oxley discouraging foreign firms from listing their shares on U.S. indexes, fast-growing companies from abroad have had little incentive to care! Yet Money Morning can help change all this for investors intent upon making sizeable, steady and safe gains – and who want to capitalize on the biggest profit opportunity we’re likely to see in our lifetime. We exist to even the playing field; to help you reclaim control of your own financial destiny. Our worldwide research staff includes former investment bankers, international financiers, emerging markets specialists and veteran financial journalists. # Inside news on the hottest investments, including water, uranium and private equity… # And news on rules and regulations, financial trends and strategies – and any other “market intelligence” that you will need to become a shrewd-and-successful investor in the greatest global investing boom most of us will ever see. And it’s all delivered directly to you – and at no charge. Here’s to securing your financial freedom in the new global economy.